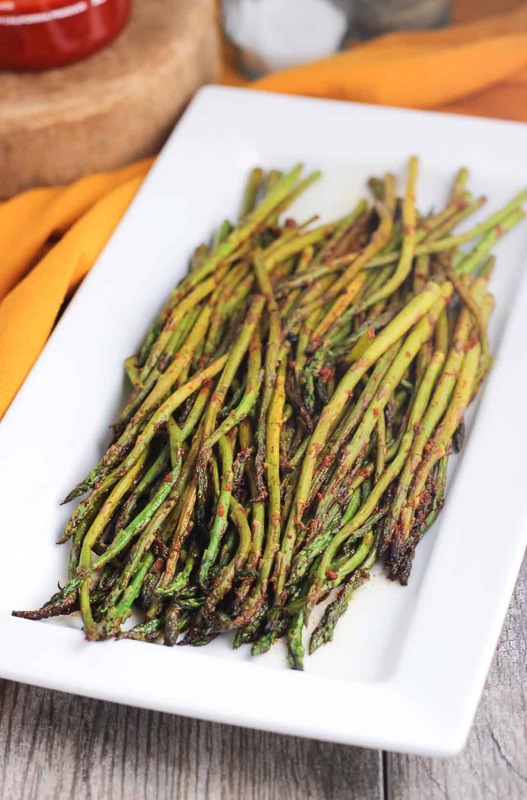 Slightly crisp and spicy stovetop asparagus is an easy side dish favorite! 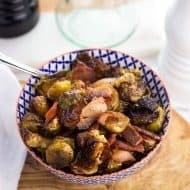 With five simple ingredients and twenty minutes time, you can whip up a flavorful and addictive vegetable dish with a customizable spice level. Please say hello to the side dish that makes me lose self-control. 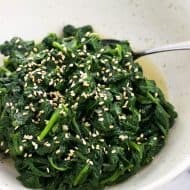 It’s easy, is a great accompaniment to all sorts of meals, and just may have addictive properties. That good. 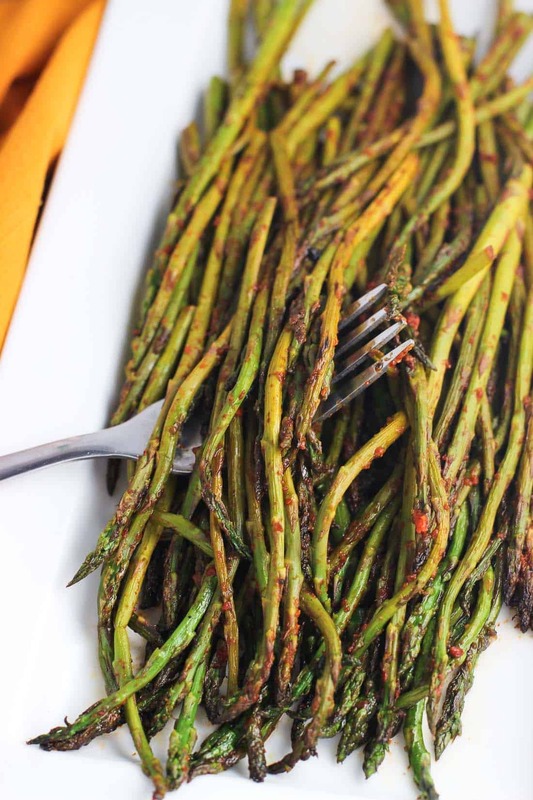 In the early days of making this spicy asparagus we’d throw the whole bunch on the grill and let it cook until the outside had slightly crisped. Then I’d count the seconds until those crisp and spicy stalks cooled just enough to not burn my mouth entirely when I inevitably chowed down before they had a chance to reach our dinner plates. Every time! Now that we’ve been without a grill for some time, we thought our spicy asparagus days were on hiatus. But not anymore! Spicy asparagus 2.0 is made on the stovetop with a few tips and tricks to ensure it’s still crisp and sings every bit of that siren song as the grilled version. The flavors here are bold but simple. Asparagus is brushed with olive oil, sprinkled with salt and pepper, and then drizzled with as much or as little sriracha as you like. What’s a big game changer here is using a cast iron pan that’s been preheated in the oven. 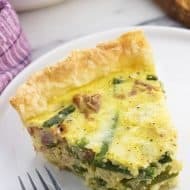 A nice and hot pan (I linked the kind I use below) is key in giving the asparagus a crisp exterior while still maintaining a nice little snappy crunch when you take a bite. I wish I could recommend a favorite meal or two that this spicy stovetop asparagus pairs well with, but in all honesty EVERYTHING comes to mind. In the past few months alone, I’ve eaten this as a side to curry chicken salad with cashews and burgers, in omelettes, by itself as a midnight snack straight from the fridge…basically everything I can. 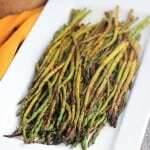 Slightly crisp and spicy stovetop asparagus is an easy side dish favorite! With five simple ingredients and twenty minutes time, you can whip up a flavorful and zingy vegetable dish with a customizable spice level. Heat oven to 400 degrees F and place a cast iron pan into the oven until it's hot. Trim about 1" from the ends of the asparagus and discard. 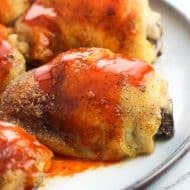 Remove pan from the oven (carefully - using oven mitts!) and place on stovetop over medium-high heat. Place asparagus in a single layer on the bottom of the pan and brush with olive oil. Sprinkle with salt and pepper and drizzle your preferred amount of sriracha over asparagus. Cook for about 3-5 minutes, or until the asparagus has browned on the bottom. Using tongs, flip the asparagus to the other side until it has browned, about 2-3 minutes. Remove from heat and serve. Ideally you want to keep the asparagus in a single layer so it cooks evenly, so depending on the size of your bunch you may need to cook the asparagus in two shifts (or use a very large cast iron pan). Hi Alyssa, I need to find a way to prepare boneless country style spare ribs. I’ve tried everything…either they come out tough and chewy or limp and tasteless. I tried cooking them in my crockpot and it was like chewing on dust. help!! Would this work for roasting the asparagus in the oven? Hi Laura, yes that would work. I’d arrange the asparagus in a single layer on a baking sheet, brush on the olive oil evenly, and add the sriracha/salt/pepper. Roast time will depend on how thick or thin your asparagus is, but I’m thinking somewhere between 10-15 minutes? I’m not sure it’ll have as many blackened/crisp bits as it does preparing it on the stovetop, but all the flavor will still be there! Ok I don’t hardly eat asparagus because I can never think of a good way to cook it, but now I know! I love that you used sriracha! We’ve been adding sriracha to more and more foods lately – we can’t get enough! 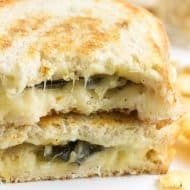 This recipe is so good when you throw the asparagus on the grill, but now that it’s winter (…and we don’t have a grill) I’m so glad to have the stovetop as an option! Omg Alyssa! You can make asparagus look gorgeous and delicious! Yum! We love us some asparagus! And I really like that this has a kick! And such great tips for cooking it! I’ll take asparagus any old way, but I’m kind of obsessing over spicy asparagus! Grill or no grill. 🙂 Thanks girl! Okay we are having some Asian meatballs tonight and I didn’t know what to fix with it…now I do!! 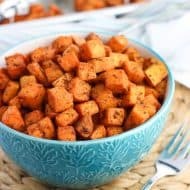 I love how easy this is, I have all these ingredients all the time! That sounds like such a great pairing Annie! I need to make those Asian meatballs with this asparagus next time. So good! Well I need to get my spice on now!!! Delish!